Former Texas running back [tag]Cedric Benson[/tag] had a huge 189-yard performance against the team that dumped him. Against the Bears he rushed for a career high in yards on 37 carries and now leads the league in rushing yards. Former Texas running back [tag]Cedric Benson[/tag] had career highs today with 171 yards and 38 carries for the Bengals against the Browns. No touchdowns and his longest run (46 yards) actually ended with him fumbling the ball but Benson’s running was huge for Cincinatti today and helped them win their first road game of the season. He looked like the big tough workhorse he was when he was with Texas today and could be back on track if he continues to run hard on the field and stay out of trouble off of it. [tag]Tarell Brown[/tag] – Brown had a quiet night in a loss to the Seahawks. Brown had two tackles in the game. [tag]Cedric Benson[/tag] – The Bengals are awful, but Benson has been a bright spot in his short time there. Benson ran the ball well in the first half before being taken out of the game plan because of the deficit his team faced. He finished the game with 13 carries for 49 yards and two receptions for 20 yards. 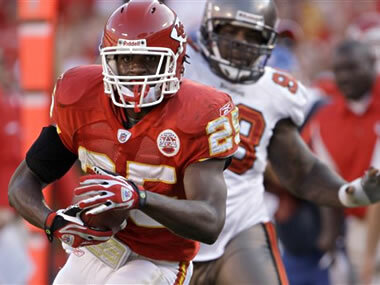 [tag]Jamaal Charles[/tag] – Charles had his best rushing day of his young career on Sunday averaging nine yards on five carries including a long thirty yard run. Starting running back Larry Johnson continues to miss time because of off the field issues, so the rookie’s role should continue to grow. [tag]Leonard Davis[/tag] – The Cowboys got back on the win column, but it had little to do with the play of the offense. Dallas has suffered a lot of injuries but the play of the offensive line has to be disappointing. [tag]Phil Dawson[/tag] – Dawson continues to play well going three for three with a long of 42 in the Cleveland win of Jacksonville. [tag]Michael Griffin[/tag] – The Titans made a statement on Monday night in a win over the Colts. Griffin was all over the field finishing the game with eight tackles. [tag]Ahmard Hall[/tag] – The Titan running game changes focal points throughout the game with the combination of Chris Johnson and Lendale White, but the one constant is the consistent blocking ability of Ahmard Hall. Hall played well again as the Titans remain undefeated. [tag]Casey Hampton[/tag] – Hampton got back in the stat column after struggling with injuries throughout the year. The big defensive tackle recorded six tackles while controlling the middle of the line. [tag]Michael Huff[/tag] – The Raiders and Michael Huff continue to struggle. The former Thorpe Award winner was credited with two tackles and no pass breakups in the loss to the Baltimore Ravens. [tag]Quentin Jammer[/tag] – Jammer went all the way to London to get hurt. He finished the game with six tackles before he left the game with a minor leg injury. The game was not good for either team’s secondary. Jammer gets a week off to heal up. [tag]Derrick Johnson[/tag] – DJ had a chance to be a hero against Brett Favre and the Jets but he dropped a potential interception that hit him right in the numbers. He finished with six tackles in the loss. [tag]Cory Redding[/tag] – Redding recorded five tackles and a half sack in another Detroit loss. I feel bad for anyone playing in Detroit, Roy Williams got out, now we need Redding to follow. [tag]Shaun Rogers[/tag] – Rogers was dominant for the second straight week. When Rogers plays all out he could be the best interior lineman in the game. In the win against the Jaguars the nose tackle recorded nine tackles and a sack. [tag]Bo Scaife[/tag] – The Titans are the best team in the league right now and everywhere you look a former Longhorn standout is making a contribution. Scaife looks to be the best tight end on the squad even with the addition of Alge Crumpler. On Monday night Scaife had five catches for 44 yards. [tag]David Thomas[/tag] – Thomas caught a ball after going a week without one. The Patriots won the game and Thomas is one of many tight ends New England uses. [tag]Ricky Williams[/tag] – Williams scored a touchdown but was held to 16 yards on seven carries in the upset win over the Bills. He did have a 47 yard reception in the game but gave a fumble that set up a score for Buffalo. [tag]Roy Williams[/tag] – Roy Williams scored his first touchdown as a Cowboy on a two yard fade in what ended up being the only touchdown of the game. Williams wasted no time pleasing his Texas fans by putting up a “Hook em’ Horns” sign in the air for the world to see. Another good week for Michael Griffin and a big day for Cedric Griffin but the biggest news was a couple of former Horns returning to the field. Titans’ QB Vince Young returned to the practice field and RB Cedric Benson hit the field for the Cincinnati Bengals for the first time since his signing earlier in the week. [tag]Cedric Benson[/tag] – Benson made his Cincinnati Bengal debut this weekend verse the Cowboys. His first run went for seven yards, but he didn’t get much done after that finishing the day with 30 yards on 10 carries. [tag]Justin Blalock[/tag] – Blalock is going to become one of the better inside lineman in the NFL. His Atlanta Falcons pulled an upset over Green Bay, and the offensive line play has been a good surprise for the up and coming team. [tag]Jamaal Charles[/tag] – The rookie played well when he got the chance but the combination of playing behind Larry Johnson and his team being down big limited his snaps. He had four carries and four receptions for a total of 40 yards. [tag]Leonard Davis[/tag] – It appears getting out of Arizona was just what the big man needed. He is not alone in that regard. Davis is still the biggest man I’ve ever met in person, and appears to engulf most defensive players unfortunate enough to lock up with him. [tag]Cedric Griffin[/tag] – Griffin played his best game of the season in the victory over New Orleans on Monday Night Football compiling 10 tackles. The highlight of the game came when Griffin laid out a Saints tight end late in the game. [tag]Michael Griffin[/tag] – Michael Griffin had an interception in the Titans win over the Ravens. His play has helped Tennessee move to 5-0 on the young season. [tag]Ahmard Hall[/tag] – Ahmard is playing at a high level even though the Titans struggled on the ground against a stout Baltimore defense. Tennessee even gave him a touch on an eight yard reception. [tag]Quentin Jammer[/tag] – Jammer had a quiet day as his Chargers lost to the Dolphins. Teams seem to be avoiding his side of the field which is a huge compliment in the NFL. He recorded four tackles on the day. [tag]Derrick Johnson[/tag] – The light has finally come on for DJ in the NFL. He backed up last week’s stellar performance with a nine tackle day. His team is awful and I hope he doesn’t have to play there his whole career because it will be a waste. [tag]Brian Robison[/tag] – Robison didn’t record any stats Monday night, but was on the field more than he had been in previous weeks. He is stuck behind All-Pro Jared Allen. [tag]Bo Scaife[/tag] – Scaife finally seems to be getting on the same page as new quarterback Kerry Collins. Scaife had a huge day, catching seven balls for 72 yards in a Titan win. [tag]Ricky Williams[/tag] – Ricky is now the clear number two back in Miami behind Ronnie Brown. The Heisman trophy winner finished the game with 39 yards on 13 carries. [tag]Roy Williams[/tag] – Roy had a good day when it comes to stats, catching a team high seven passes for 96 yards. However, his antics on the sideline rubbed a few fans and teammates the wrong way. 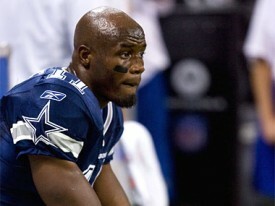 Williams could be acting out to help get out of Detroit and avoid the franchise tag in the off season. If that is the case, I say God bless him. Would you want to play anything in Detroit? [tag]Selvin Young[/tag] – Selvin finished the game with 38 yards on 10 carries, adding one reception. The Broncos play musical chairs with their tailbacks so it is no surprise Young’s production has dropped each week. [tag]Vince Young[/tag] – Back at practice but still not full strength and not starting. He was the backup to Kerry Collins in Sunday’s game against Baltimore. Former Longhorn running back [tag]Cedric Benson[/tag] has signed with the Cincinnati Bengals. Last week two separate Travis county grand juries decided not to indict Benson and less than a week later he’s found a team that needs his services enough to take a chance on him. He had worked out for several teams since being released by the Bears but the lingering legal issues made teams reluctant to sign him. Benson will come in and back up Chris Perry who is averaging only 2.9 yards per carry so far this season for the Bengals. If he picks up the offense quickly, he should be able to compete for carries and possibly the starting spot. With running back DeDe Dorsey out for year, the Bengals turned to a star-crossed former first-round pick in Cedric Benson to back up Chris Perry Sunday in Dallas. Benson joins the Bengals five days after two Travis County grand juries declined to indict him on charges of boating while intoxicated, resisting arrest and driving while intoxicated. in two spring-time incidents that spurred his release from the Bears. Dorsey went to season-ending injured reserve with a hamstring injury while Perry’s other backup also nurses a hamstring problem. Kenny Watson, inactive last Sunday, appears to at least be questionable for the Cowboys, leaving only Perry and fullbacks Daniel Coats and Reagan Maui’a as healthy in the backfield. The most interesting part of the story isn’t that Benson signed with an NFL team so quickly, it’s that the Bengals took another chance on a player with off-field issues. Bengals players over the last several years have repeatedly had run-ins with police and the team is on thin ice with NFL commissioner Roger Goodell on the issue. The team talked big back in April about community standards when they released WR Chris Henry and then re-signed him four months later. The signing of Benson makes football sense for the team but will likely have public relations repercussions in the city of Cincinnati.